This year marks the 30th anniversary of the Louise McBee Lectureship in Higher Education. 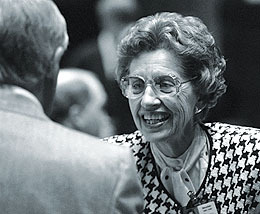 The series honors Dr. Louise McBee, who held leadership positions for more than 25 years at the University of Georgia before serving for more than a decade as a champion for higher education in the State House. Distinctiveness and distinction characterize the Louise McBee Lecture series at the Institute of Higher Education, which is one of the few annual lecture series in the United States that focuses solely on higher education. Founded in 1989, the series has brought numerous persons of great distinction to IHE and the University of Georgia to comment upon key directions and themes in higher education. Some lecturers are primarily known for the leadership that they have exerted in American higher education. These include Hanna Gray, former president of the University of Chicago; Katherine Lyall, president of the University of Wisconsin System; Jamie Merisotis, president and CEO of Lumina Foundation for Education; Nancy Zimpher, Chancellor of the State University of New York; Teresa Sullivan, President of UVA; and Mary Sue Coleman, president of the University of Michigan. Video shown at the beginning of the 25th anniversary lecture honoring Louise McBee.